A DIRECTIVE TO immigration officials across the country to try to portray undocumented immigrants swept up in mass raids as criminals came directly from then-Secretary of Homeland Security John Kelly, The Intercept has learned. Emails, obtained through a Freedom of Information Act request by students at Vanderbilt University Law School, show that while hundreds of undocumented immigrants were rounded up across the country, DHS officials tried — and largely failed — to engineer a narrative that would substantiate the administration’s claims that the raids were motivated by public safety concerns. 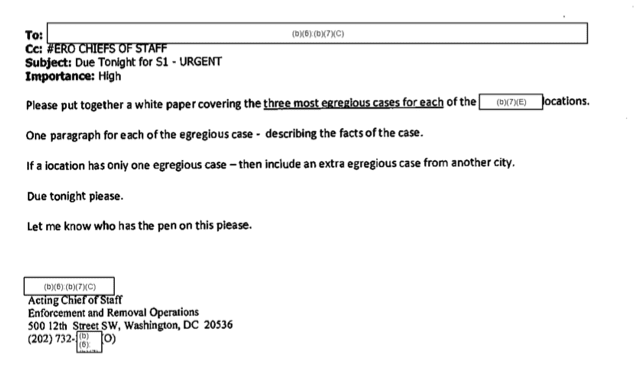 In the emails, local ICE officials are ordered to come up with “three egregious cases” of apprehended criminals to highlight to the media.